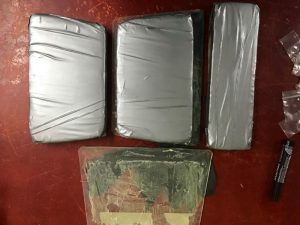 [fA woman was among three persons arrested after her 19-year old daughter, who she accompanied to the Cheddi Jagan International Airport, was allegedly busted with cocaine in her handbag, the Customs Anti-Narcotics Unit (CANU) said. She was accompanied to the airport by her mother and family members. The total weight of suspected narcotics is 2.660 kg. “Three persons including the young woman and her mother are currently in custody assisting with the investigation,” CANU said. CANU added that, “irrespective of life’s challenges civilians must recognize that the narcotic trade must Never be an option.